The land in question, and the borderline that divided El Paso from Juárez, was disputed soon after the Treaty of 1848 specified the Rio Grande as an international boundary. The natural element that preexisted the region’s inhabitation and motivated its settlement, chosen as a stable marker of sovereign limits, proved indifferent to politics. Between consecutive surveys in 1852 and 1873 a series of natural shifts pushed the river south, redistributing approximately 600 acres of land from Mexico to the United States. Both countries claimed ownership of the territory. Mexico believed the original survey line should be honored, while the United States claimed the boundary shift was gradual and, in accordance with international law, the territory was theirs. To complicate matters further, a small parcel of land nicknamed Cordova Island was recognized as a Mexican enclave north of the Rio Grande, created after a man-made channel streamlined the river in an effort to control flooding and additional erosion. The following analysis frames compositional fragments of the El Paso Times photograph as political props, defined as material elements that support the border as a project performed and in turn allow for the reconstitution of national limits to occur. By tracing the role and history of territory, monument, and federal agents central to the Chamazal ceremony one is able to understand the relevance of things represented and, more importantly, assert the absence of both landscape-engineering and urbanism—elements that played a vital role in the definition of the United States-Mexico border during the mid-twentieth century yet were denied visual representation. Photographs, especially those that emanate from news media, are public artifacts to be interpreted. Often serving as secondary visual support alongside descriptive text, these images contain their own agency that expands far beyond the individual caption. Even when the image is directed by a single figure and carefully composed, ownership or authority of meaning does not exist. While it is possible, even necessary, to consider photographs as an assemblage of components, each with their own history and relevance, an overall reading of the artifact cannot be reduced to a single element. The El Paso Times photograph can thus be framed as an assemblage of actors—including territory, monument, politicians, press, and audience. Once traced, individual threads can be reconstructed to offer new meaning. The relationship of territorial limits to riverbed is the first thread to examine, depicted as unified—and static—vectors at the Chamizal ceremony. Such representation ignores a history of disjunction between natural barrier and theoretical boundary line that was well documented on the United States-Mexico border. Confronted with the unruly course of the Gila River, a regional waterway that designated an early portion of the international boundary, nineteenth-century commissioners William H. Emory and José Salazar reconciled the futility of their efforts with poetic reflection. The river was better suited as a monument to the evolving forces acting on the border, they would write, than as a fixed limit of sovereign territory. Any attempt at survey was inconsequential. Shifting natural boundaries were given explicit representation four decades later when a fifteen-mile stretch of the Colorado River was surveyed in 1893 by the United States and then again by Mexico one year later. “Official map No. 19” shows their efforts superimposed, revealing a tangled network of tributaries and islands formed through time, or perhaps simply by subjective viewpoints (fig. 2). All 1,255 miles of the Rio Grande could thus be conceived as a dynamic path with an internal logic of its own, redistributing national territory at will. Yet, as unsettling as the concept was to governing bodies, such acts of natural deviance were only of consequence in settled locations where built structures and populations could be quantified along with acreage lost or gained. The boundary shifts that accumulated between El Paso and Juárez by the beginning of the twentieth century produced a thick liminal zone of contestation. An early 1909 meeting between Presidents Taft and Porfirio Díaz to negotiate the land was disrupted by a violent riot that led in headlines. “Diaz-Taft Meeting marred by Tragedy; Boys Duel Over Flags,” ran the banner of the Atlanta Constitution. The event overshadowed Taft’s visit to Juárez, reported as the first time in history a United States president traveled outside of national limits. A year later, an arbitration proposal (mediated by an “impartial Canadian jurist”) that split disputed land equally between nations was deemed a failure. Both the United States and Mexico rejected the compromise, concluding in a final report: “The present decision terminates nothing; settles nothing. It is simply an invitation for international litigation. It breathes the spirit of unconscious but nevertheless unauthorized compromise rather than of judicial determination.”  Not only was territory in question, which included a residential population and small industrial center of factories and warehouses, but also the fundamental relationship of sovereign limits to historic boundary markers. Cordova Island, a Mexican enclave north of the river in otherwise United States territory, exacerbated this tension. Occupying a geographic position outside the normative national bounds, the land mass became a troubled grey zone for federal jurisdiction. Nicknamed el barrio del Diablo (or “neighborhood of the devil”) it was a site noted for drug smuggling and illegal immigration. Due to sparse historical records, largely based on personal accounts, the sole geographic reference for the Rio Grande agreed upon by both nations was the original survey conducted in 1852. This survey line held authority for over one hundred and twelve years, cited in ongoing international negotiations and ultimately serving as the primary reference for the reconstruction of the river in the 1960s. Amidst encroaching Soviet influence on Mexico and Latin America, John F. Kennedy reopened the Chamizal case in 1962. The threat of communist infiltration through the nation’s southern edge motivated resolution with then Mexican President Adolfo López Mateos citing the dispute as the “number one problem in US-Mexican relations.”  The land was negotiated within a larger international program, the Alliance for Progress, which provided United States government aid to Latin America—publicized as support to “complete the revolution of the Americas” and ward off Soviet control. Along with funding in support of democratic governments, education, and social housing the United States officially recognized the original survey line between El Paso and Juárez, effectively “giving back” 600 acres of land to Mexico. A map from the city of El Paso titled “Land Affected by the Chamizal Settlement” shows the land in question as well as the location of the Chamizal ceremony (fig. 3). Grey poché fills the disputed territory, bound by the Rio Grande in the south and its future (or nineteenth-century past) course in the north. A thick dotted line labeled “relocated river channel” snakes through the center, representing the 1852 survey superimposed on an urbanism that had since grown to a half million in population. A new “border highway” is offset north of the channel, signifying dual lateral infrastructures of water and transportation that would give uninterrupted material presence to the borderline. 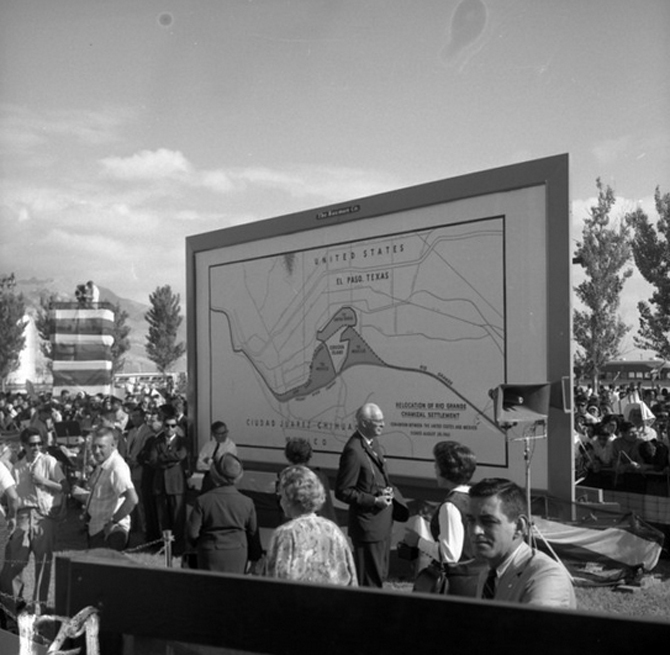 While boundaries, acreage, and infrastructure are presented with diagrammatic clarity, the displaced residents of the Chamizal, estimated at 5,600 at the time the land was rezoned, are denied visual presence. A speckled hatch over the contested land obscures any reading of residential side streets or human occupation. The location of the ceremony is labeled with a number one, taking place in United States territory on a sports field at Bowie Senior High School. While ample space was a requirement for the large public gathering, it should be noted the distance the event took place from the downtown districts of El Paso and Juárez. These adjacent urban zones, connected by three international bridges linking the urban communities and labeled as “new ports of entry,” are in close proximity and linked with a continuous commercial strip. In comparison to Bowie Senior High School and the simulation of context that was constructed there, a distinctive site existed less than two miles away, operating in reality as an international joint between the two nations. When given the choice between real site and abstracted reproduction, federal administrators chose the latter. For Adolfo López Mateos the ceremony symbolized far more than the correction of a historic injustice; it was tied to the ongoing urban development of Mexico’s northern border, spearheaded through the federal program Programa Nacional Fronterizo or PRONAF. 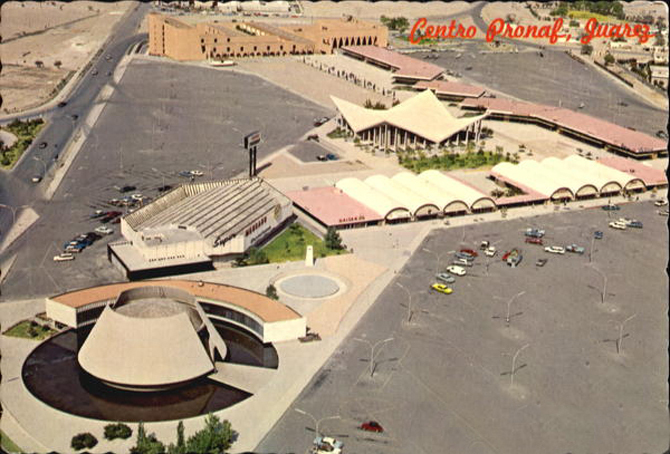 In the year of 1965 alone, head architect Mario Pani designed “regulatory” master plan developments and architectural projects for eight of twelve Mexican border cities including Juárez. 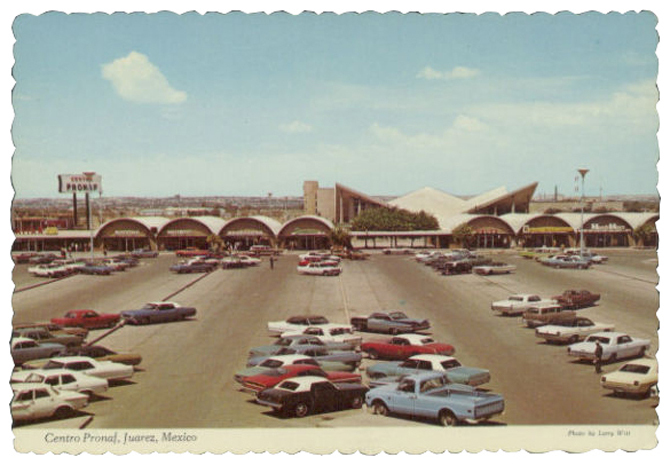 The full urban ambition for Juárez was published in the journal Arquitectura/México and featured an economic free zone, the “Zona PRONAF,” to promote United States tourism through new shopping centers and a museum in close proximity to the border (fig. 4,5). The development plans depict El Paso and Juárez as a single urban development, connected by a network of infrastructure spanning both sides of the international boundary. 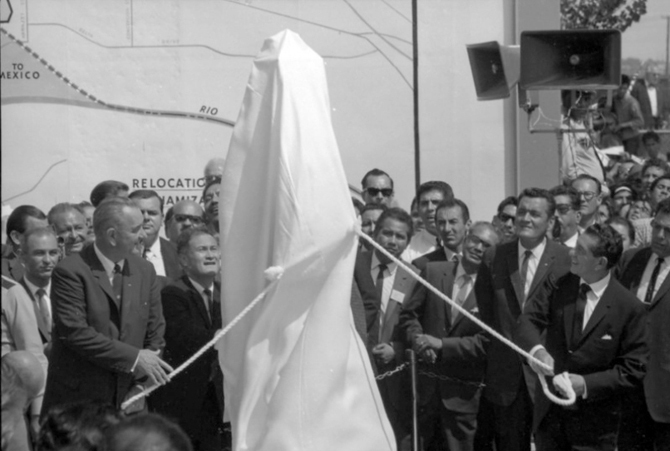 Despite a contemporary conception of the border as a geopolitical, urban zone, the Chamizal ceremony employed an anachronistic object—the border monument—to symbolize binational agreement. Historically, border monuments were positioned to correspond with a precise coordinate on the international survey line. Commissioned, inscribed and placed by both the United States and Mexico, they were unique bilateral objects operating across and reflecting on separate territories and philosophies of nationhood. The original monuments were designed in heavy cast-iron as material markers, sequentially numbered and intervisible from one lateral view to next along the entire length of the US-Mexico border west of the Rio Grande. These artifacts of visual reference operated as a set of standardized, engineered points, placed with geographic precision and objective finality. Their placement was inextricably linked to the constitution of sovereign limits, with the international seam bound to their exact location. The form and operative position of the Chamizal Monument can be traced to the late nineteenth century. Measuring six-feet nine-inches tall and one-foot wide at the base, it was the same scale and proportion as border monuments deployed in a joint 1891 international survey but was of a different material and construction type. In comparison to the original material of rough cast-iron, the Chamizal Monument was one-of-a-kind and produced in gleaming chromium-plated steel. It reflected actions immediately adjacent in sharp clarity and the surrounding atmosphere with rippled distortion. One could imagine that without the context of political fanfare the monument would simply reflect its natural surroundings and effectually disappear, an anti-monument of sorts. It simultaneously represented and denied a geographically specific location. Though the artifact had binational inscriptions, it was not numbered in relation to existing monuments. It sat in obscured isolation, a single self-referential point that had no visual connection to a larger context. Further, rather than constructed or placed the monument was revealed to an awaiting audience, exposed from under a white sheet by the combined effort of Johnson and Mateos (fig. 6). At a moment when a conception of the bilateral had expanded far beyond the production of theoretical maps and monuments, the international boundary line as pure construct of the nation-state was asserted through simulacra and choreographed performance. A series of unmarked images from the Chamizal ceremony, stored in the El Paso Times media archive, depict alternative views from that of the main press photograph. Offering a range of focal depths and taken at oblique angles and moments throughout the day, they provide valuable information as to the federal scenic design and broader context of the event. The archival El Paso Times images, unedited and without organization, sit between the constructs of government and press to offer a distinct perspective. “Unmarked image No. 179” reveals the backdrop map to be a thin plane, reminiscent of a grounded billboard positioned within an expansive crowd (fig. 7). It is just large enough to fill the frame of a frontal photograph and block the background of buses, trees, and onlookers. An expanded view of the crowd in relation to both presidents and First Ladies Claudia Johnson and Eva Mateos is provided in another unmarked series image. Taken from above the heads of an applauding public, the composition is centered on Lyndon Johnson holding the hand of Adolfo López Mateos in the air (fig. 8). The obelisk monument that served the proud focus of the main press photograph barely registers, mirroring adjacent figures at the base only to stand out above the crowd. The alternate images make clear a construction of place that could only be represented as total environment through an equally constructed photographic image, framed by a privileged and unobstructed frontal viewpoint. 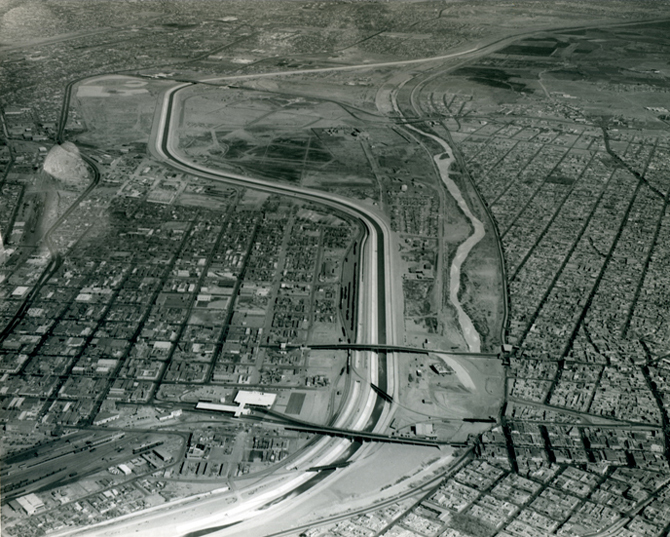 Rio Grande channel under construction, 1965. © National Park Service, U.S. Department of the Interior. 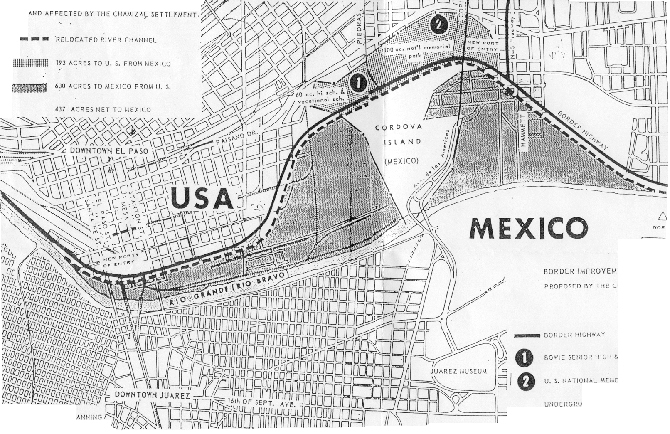 Rio Grande channel completed, 1969. © National Park Service, U.S. Department of the Interior. 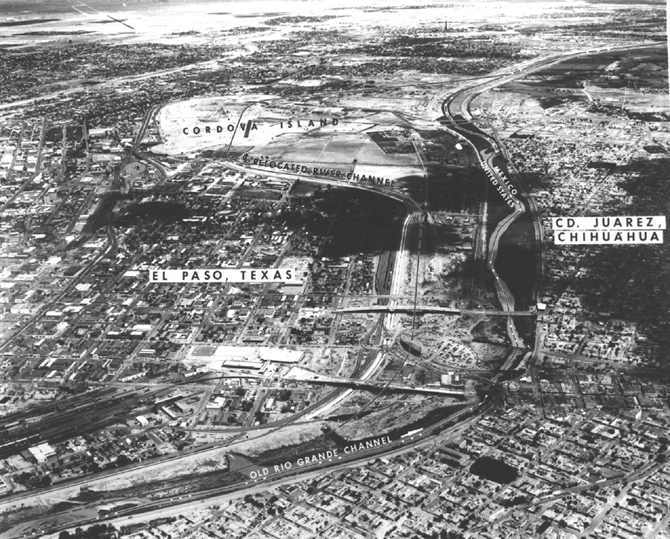 If the El Paso Times photographs represent a social fiction of place and placing, then the aerial images of the Rio Grande channel provide evidence of the realized alternative. It was precisely the acts of engineering that governed the reconstitution of international limits—in relation to geographic survey and channel construction—that were denied visual presence at the Chamizal ceremony. Whereas the Chamizal Monument functioned as a symbol of binational agreement, a political prop that organized the main press image, the channel was an instrument of binational division that gave uninterrupted material presence to the boundary. Thus, as an alternative to the projected act of “giving back,” the negotiation of the Chamizal can be read as a means to assert territorial limits and spatial distance at the height of the Cold War. Abstract survey lines and the soft, shifting edge of the Rio Grande riverbed were replaced by formalized concrete infrastructure. 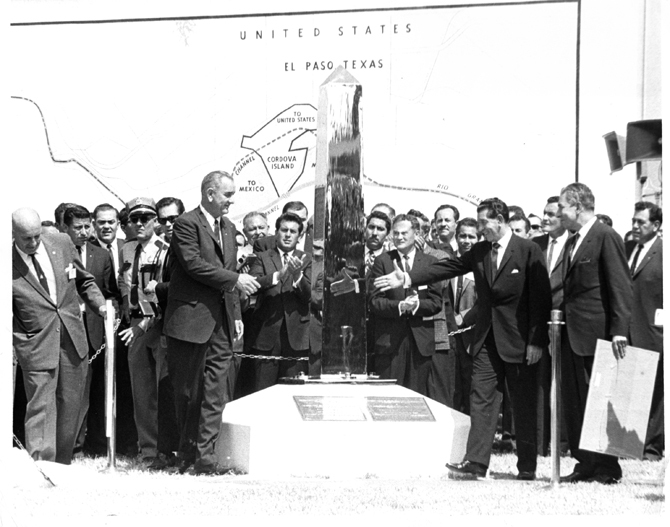 On December 13, 1968, four years after the Chamizal ceremony, Lyndon Johnson and Gustavo Diaz Ordaz traveled to the border of El Paso and Juárez to celebrate the completion of the Rio Grande channel. They met at the center of the newly built Santa Fe International Bridge, where the Chamizal Monument had been stripped from its base and relocated. 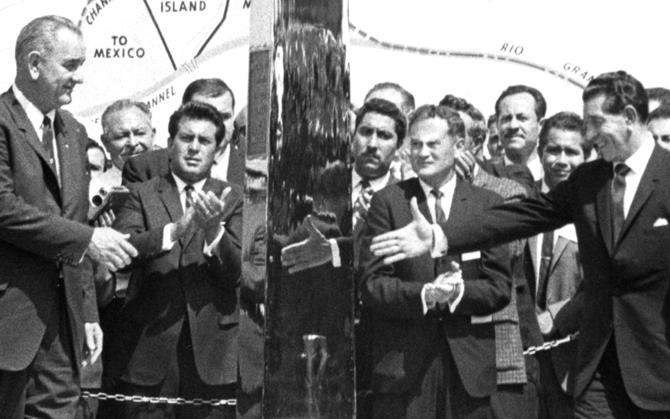 In a repeat performance of the 1964 ceremony with modified actors, location, and marker, the two presidents clasped hands in front of the chrome obelisk and symbolically atop the survey line. Again, the ritual was documented as binding social contract and disseminated by international press. After shaking hands, Johnson and Ordaz approached a platform with a raised red button. Their final act was orchestrated as a display of federal control over nature and the riverbed: a simultaneous compression by both presidents was rigged to detonate an earth dam a half-mile away, allowing the river behind to surge through its new course. However, the performance of wilderness tamed ended in anticlimax. An insufficient blast of dynamite resulted in a “trickle” of water to emerge instead of a mighty current.31 In a final moment of failed rupture, the federal act of engineering that reshaped sovereign limits was not even allowed presence through the choreographed act of simulation. Instead, fittingly, it was represented solely by the malfunction of a single button. 1. Report on the United States and Mexican Boundary Survey, made under the direction of the secretary of the interior, by William H. Emory. Major First Cavalry and United States Commissioner (Washington: A.O.P. Nicholson, printer, 1857), Ex. Doc No. 108, 34th Congress, 1st Session, 21. 2. Richard L. Lyons, “Peace Nears For World, LBJ Says: He Meets Mexican Chief, Dedicates Chamizal Shaft,” Washington Post, Times Herald, September 26, 1964, A1. 3. See: Excélsior, September 21, 1964, 8. 4. The earliest documented complaint is dated 1856 and described as an “anxious inquiry” to Hon. Caleb Cushin from a landowner in the Valley of El Paso, Reports of International Arbitral Awards, The Chamizal Case (Mexico, United States) June 15, 1911, Volume XI, United Nations (2006), 329. 5. Mexican surveyors stated “the destruction of the right side [of the Rio Grande or Bravo del Norte] almost wholly took place during the great swell years 1864, 1868, 1874.” Chamizal arbitration: “The countercase of the United States of American before the International boundary commission,” United States of Mexico, Hon. Eugene Latleur presiding under the provisions of the convention between the United States of American and the United States of Mexico, concluded June 24, 1910, with appendix and portfolio of maps (Washington: Government Printing Office, 1911), 6. 6. Though the Treaty of Guadalupe Hidalgo specified the Rio Grande as an international boundary in 1848, the course of the river was not surveyed and documented until 1852. See Map No. 29 of the Boundary Commission, Messrs. José Salazar Ylarregui and General W.H. Emory. 7. For starters, see “Johnson, Lopez Mateos Meet at El Paso Today,” Los Angeles Times, September 25, 1964, 4, and “Johnson Says US Won’t Spark War: In El Paso He Vows Not to Frighten Other Nations—Meets Mexican Chief,” New York Times, September 26, 1964, 1. In Mexico, see “Eso es la Devolución de El Chamizal: Resultado de negociaciones tan honrosas como cordiales entre ambos países,” El Informador, September 26, 1964, 6-A. 8. Art historian Ariella Azoulay has theorized the medium of photography as a social contract, one that is used to both disclose and promote the negotiations of involved parties. “The invention of photography offered the gaze an absolute plane of visual immobility,” she writes, “a plane on which all movement is frozen, transformed into a still picture that can be contemplated without disturbance.” See Ariella Azoulay, The Civil Contact of Photography (New York: Zone Books, 2008), 93. 9. This concept was relayed literally by the Los Angeles Times. A statement, perhaps written tongue-in-cheek, read “A handshake Friday between President Johnson and his Mexican counterpart, Adolfo Lopez Mateos, will reduce the size of the United States by 437 acres.” “437 Acres of El Paso to Go to Mexico Friday: Nations to Seal Chamizal Treaty, Settling Long Dispute Caused by Rio Grande Shift,” Los Angeles Times, September 20, 1964, L5. 10. Kim Lane Scheppele, “Facing Facts in Legal Interpretation,” in “Law and the Order of Culture,” special issue, Representations (University of California Press) 30 (Spring 1990), 49. 11. This understanding is adapted from Kim Lane Scheppele’s analysis of the term “legal fiction” in her text “Facing Facts in Legal Interpretation.” It should be noted that the relationship of audience to fictional construct differs in the case of courtroom dynamics. In judicial proceedings fictions are well understood as a legal device, marked by linguistic qualifiers to alert the audience and avoid misinterpretation. 12. Outlined in The Civil Contract of Photography, Ariella Azoulay proposes a theory for reading the medium based on an “ontological-political understanding.” She details a comprehensive and inclusive approach that “takes into account all the participants in photographic acts—camera, photographer, photographed subject, and spectator—approaching the photograph (and its meaning) as an unintentional effect of the encounter between all of the these.” Azoulay, The Civil Contract of Photography, 23, 86. 13. “Diaz-Taft Meeting marred by Tragedy; Boys Duel Over Flags,” The Atlanta Constitution, October 17, 1909, C1. 14. “To Be Arbitrated: Canadian to Decide Whether Mexico or the United States owns Chamizal Tract,” Boston Daily Globe, June 20, 1910, 3. 15. Reports of International Arbitral Awards, 342. 16. It should be noted that even the original survey line was a fictional construct, a contractual negotiation between national survey teams who ran and marked the international boundary separately. In a journal entry dated September 21, 1857, boundary commissioners Emory and Salazar addressed the differences in national reports stating: “The Commissioners think it proper to state that in many details along the Rio Bravo, in Topography, and in Latitude and Longitude, there are small differences, the legitimate result of scientific operations performed under difficult circumstances.” Chamizal arbitration, 19. 17. William E. Blundell, “Chamizal Struggle: US Hopes for a Cold War Gain From Giving in to Mexico in Old Border Dispute,” Wall Street Journal, February 28, 1963, 16. 18. John F. Kennedy, “Preliminary Formulations on the Alliance for Progress,” Address by President Kennedy at a White House Reception for Latin American Diplomats and Members of Congress, March 13, 1961. 19. Charles Mohr, “Johnson Says US Won’t Spark War: In El Paso, He Vows Not to Frighten Other Nations—Meets Mexican Chief,” New York Times, September 26, 1964, 1. 20. 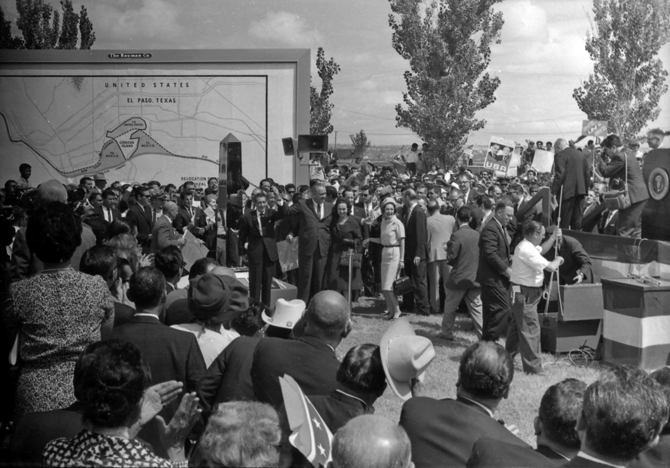 Lyndon B. Johnson, “Remarks in El Paso at a Ceremony Marking the Settlement of the Chamizal Dispute. September 25, 1964,” 1118–1119. 21. The speech of Adolfo López Mateos also privileged Cold War rhetoric over the local territorial implications of the Chamizal, focusing on the international relationship with the United States following WWII. See “Discurso del presidente López Mateos en la ceremonia de la entrega de Chamizal,” 195. 22. The Wall Street Journal reported on the Chamizal in relation to Cold War politics in 1963 stating, “Mainly with a push from the Communists, the Chamizal issue has been put forth in Latin countries as concrete evidence of ‘Gringo imperialism.’ For example, Cuban emissaries have used it to inflame feelings against the US in Venezuela, where President Betancourt’s pro-US regime is being pounded severely by leftists.” William E. Blundell, “Chamizal Struggle: US Hopes for a Cold War Gain From Giving in to Mexico in Old Border Dispute,” Wall Street Journal, February 28, 1963, 16. 23. English translation: National Border Program. For further reading see: Marisol Rodriguez and Hector Rivero, “ProNaF, Ciudad Juarez: Planning and urban transformation,” ITU 8, no. 1, 2011, 196–207. 24. Detailed urban redevelopment plans for Ciudad Juárez can be found in “Plano regulador de Ciudad Juárez,” Arquitectura/México, 1965, 62-75. 25. 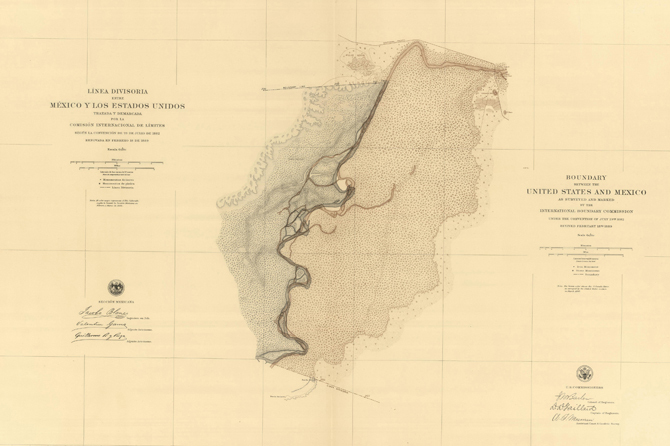 For additional information see International Boundary Commission, Report of the Boundary Commission upon the survey and re-marking of the boundary between the United States and Mexico west of the Rio Grande, 1891-1896, 3 vols (Washington: Government Printing Office, 1898). A comparable Mexican report is titled: International Boundary Commission, United States and Mexico (1882–1896), Memoria de la Sección Mexicana de la Comisión Internacional de Límites entre México y los Estados Unidos que restableció los monumentos de El Paso al Pacifico; bajo la dirección de México del ingeniero Jacobo Blanco, jefe de la Comisión Mexicana (New York: Impr. De J. Polhemus y Compania, 1901). 26. “Our Southern Boundary: Report of Col. Barlow of the International Commission,” Los Angeles Times, November 29, 1896, 11. 27. The photographic archive of the El Paso Times contains 240 images of the event, a selection of which can be found online. The complete series was first published in 2013 after unmarked photographic negatives of the event were found. T. Long, “Archive photos: Previously unpublished 1964 Chamizal treaty settlement,” El Paso Times Media Center, September 25, 2013, accessed October 3, 2014. 28. Neil Sheehan, “Johnson and Diaz Ordaz Shift Rio Grande Into a Concrete-Lined Channel,” New York Times, December 14, 1968, 18. 29. Texas Historical Commission, “Chamizal National Memorial,” Texas Historic Sites Atlas, February 2, 1974. 30. See Sheehan, “Johnson and Diaz Ordaz Shift Rio Grande Into a Concrete-Lined Channel,” 18. Nathan Friedman is an architect and former editor of MIT’s Thresholds, with recent research on the American frontier and history of federal construction at the United States-Mexico border. He has worked at Eisenman Architects in New York, SMAQ Berlin, and most recently the Office for Metropolitan Architecture in Rotterdam, focusing on a new contemporary art museum in the heart of Moscow’s Gorky Park. Friedman holds a Master of Science in History, Theory, and Criticism of Architecture and Art from MIT and Bachelor of Architecture from Cornell University.